“Something is out there and it is inducing a tremendous fear into you. You are living in a place that is giving you nightmares. 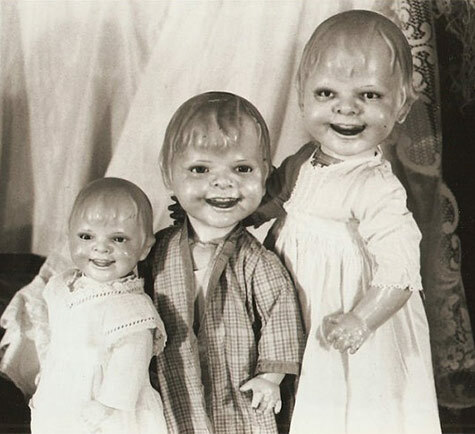 Then you wake up and whatever gave you this nightmare… is in room with you! 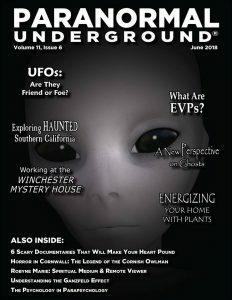 It then takes you to where it is from so that you can witness all the pain, suffering from all the people being dragged in its cave.” What I just said listens to an eerie plot for a new horror movie but believe it or not, it is really happening and Paranormal Underground Magazine takes you at the center of it! I think I have been 12 – 13 years old as I was collecting writing pads, pens, pencils, erasers… just anything I could get my hands on in order to start writing. After a while I collected that much material, I could start supplying a small bookstore 🙂 Billions of stories in my mind and no experience in how to present it on paper… it became a struggle in finding the right words for expressing the stage of the stories. Wasting paper for years and driving my professors crazy with that much papers, possessing the most diverse topics, you could start a nice bonfire with during Easter. 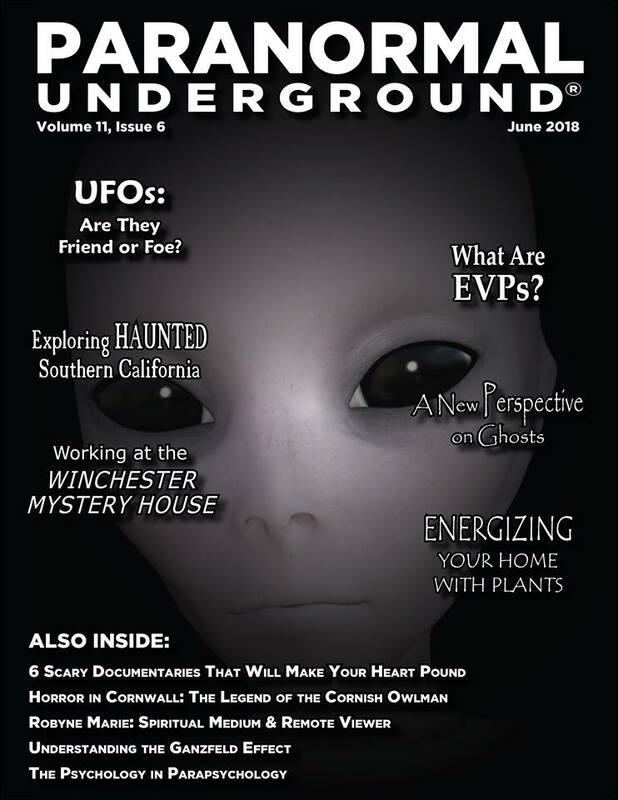 November 2015; Cheryl Knight-Wilson, editor from Paranormal Underground Magazine, published one of mine articles “UFO Abductions; A Real Extraterrestrial Experience or a Secret Military Operation?” A childhood dream came true! Over the years Cheryl taught me the intricacies of editing, the use of headlines, creating magazine covers…which even lead in publishing my own magazine The Next Truth. 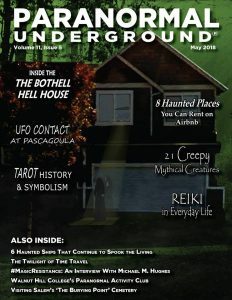 And now I have the privilege to present with you Paranormal Underground Magazine by giving you this one-time chance! 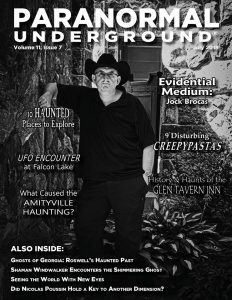 64 pages of the latest news from the paranormal world, tackling the topics that most interest paranormal enthusiasts, researchers, and investigators. 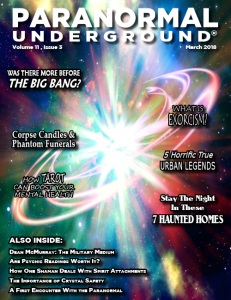 Download the PDF version of the March issue of Paranormal Underground magazine NOW and FOR FREE! Thank you all for your efforts and interesting contributions. 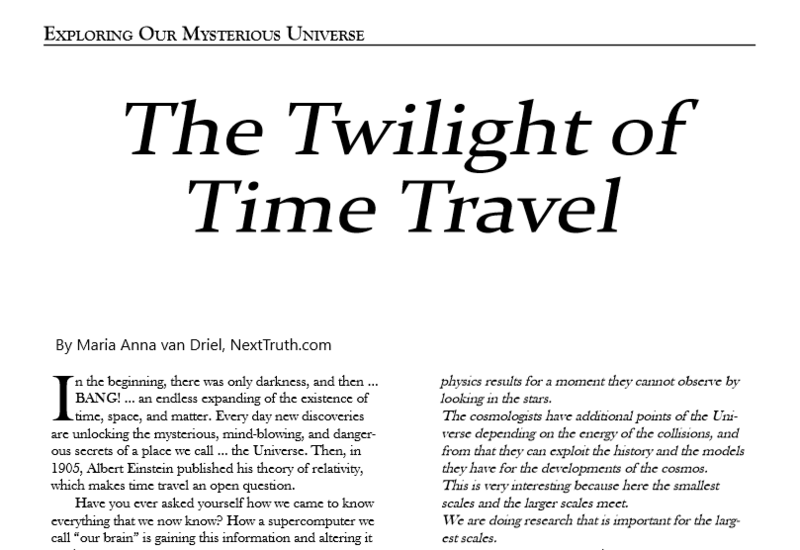 In the October issue of The Next Truth we take a look at why science fears the paranormal, if black holes can convert entropic time, if particle physics can explain some theological questions and if the sterile neutrino can point out to dark matter. Also in this issue, a quick insight in the book “Losing the Nobel Prize and a science-fiction story both written by well known scientists. 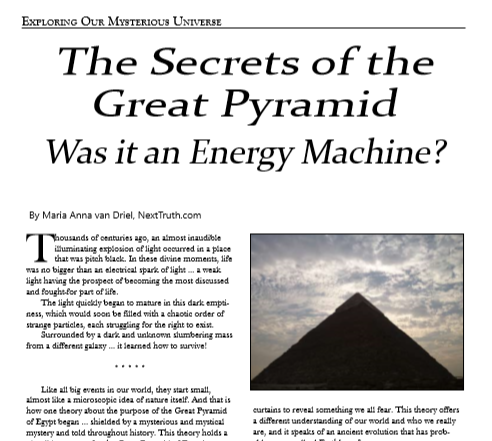 Where the Great Pyramids an Energy Machine and Did Life Started in Outer Space?…Paranormal Undergound Magazine is covering these discussions in the issue of August. 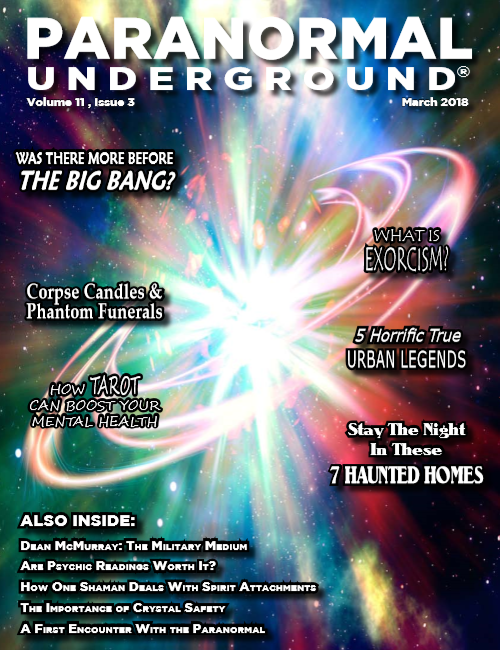 YES, the August issue of “Paranormal Underground” magazine is available for everyone who wants to know what lurks behind the foggy walls of a dormant world called…The Unexplained! Was There More Before the Big Bang? 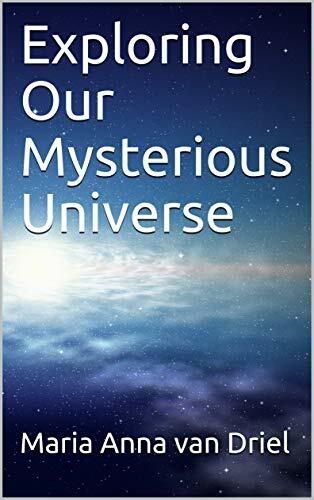 The Universe, is it truly possible that it contains an invisible and self-evolving force from a pre-big bang event and has the opportunity to let intelligent life-forms communicate with us with nearly the speed of light and over great distances? When two black holes collide, can they provoke an effect in creating a possible Big Bang whereas smaller black holes are reversing the second law of thermodynamics by using the first law of thermodynamics? And what if you fall into one?! This mysterious dark domain is the territory of erratic behaviors and silent explosions and is indeed a remarkable place to look at. 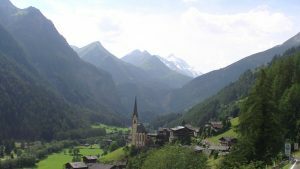 And by doing so, inescapable thoughts will pop-up … thoughts about if it would be possible that it contains an invisible and self-evolving force having the opportunity to let the future creates the past which than creates the future again. Once upon a time … a little spot, smaller than the dot at the end of a sentence, was hovering through the universe. 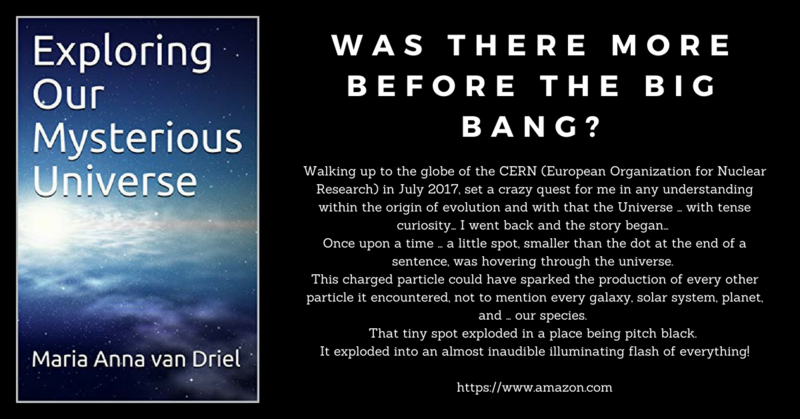 This charged particle could have sparked the production of every other particle it encountered, not to mention every galaxy, solar system, planet, and … our species. That tiny spot exploded in a place being pitch black. It exploded into an almost inaudible illuminating flash of everything! In these divine moments, life was not bigger than an electrical spark of light … a weak light having the prospect of becoming the most discussed and fought for, part of life. Rapidly it started to find its way to mature in this dark emptiness which would soon be filled with a chaotic order of strange particles, each struggling for the right to exist. This little electrical spark accelerated with the speed of Lambda* nu better known as ‘the speed of light’. It accelerated faster and faster through wormholes, black hole, universes, cosmoses … everything exploded! And sooner or later it is coming right back where we are struggling to explain the ‘Theory of Everything’ and is going to implode on itself where it will vanish for ever … what a weird story this is. 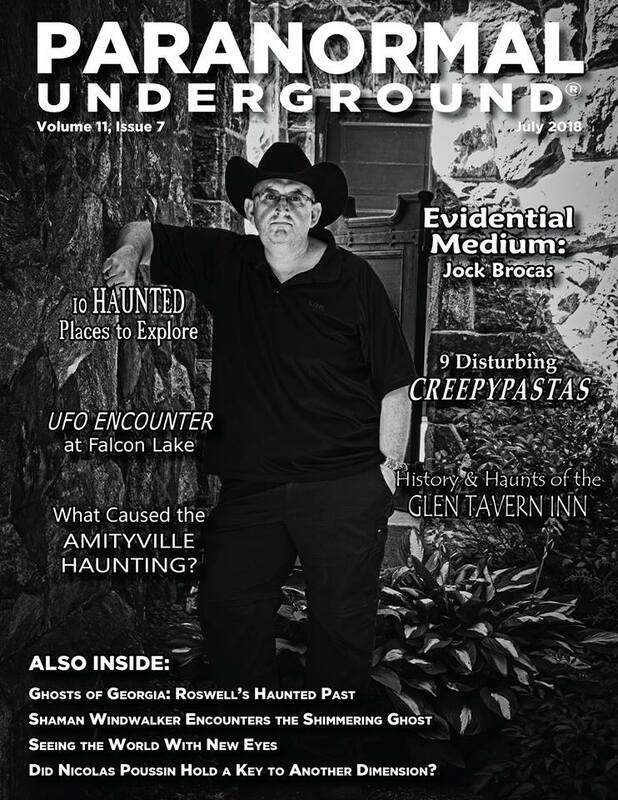 Paranormal Underground Magazine mailed that the issue of July is available for all who have the Carouge to read the coverage discussing if Nicolas Poussin held the key to another dimension, one paranormal enthusiasts ghostly tour in Roswell, Georgia…a UFO encounter at Falcon Lake, nine disturbing creepy pastas, and the haunted Glen Tavern Inn. EVP’s: What in the …bleep… are we really recording?! In physics, the law of conservation of energy states that the total energy of an isolated system remains constant. 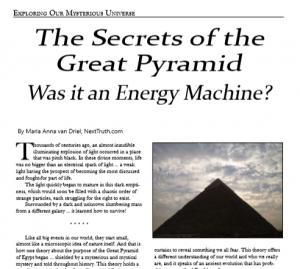 Energy can neither be created nor destroyed; it just transforms from one form to another like chemical energy can be converted to kinetic energy and can act like an explosion of that of a stick of dynamite. This kind of energy is not only a good candidate for creating an EVP but also to lift an arm or to turn the head of a creepy looking doll. 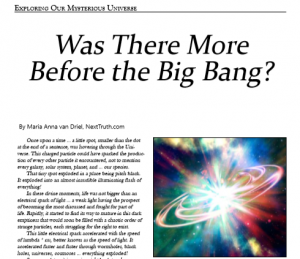 The question in this matter is, WHEN is it that we are creating this energy and … WHEN NOT?! Understanding how some ‘Earthly’ crystals can act as crazy entities and create many creepy effects in e.g. EVP’s when triggered by light, vibrations, electricity, magnetism and temperature differences, is one thing but … may I suggest an interesting as well as the one of the creepiest theories of all? What if the recordings you have captured during an investigation was not created by a crystal created by the Earths pressure? 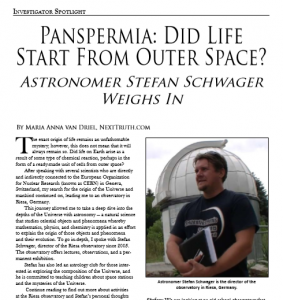 What if this (or these) crystal(s) came from outer-space due a process known in Astrobiology as ‘Panspermia’? Thus if we are the ones responsible for triggering the crystals in the most diverse objects as well as around some ancient places like for instance ‘Stonehenge’ or ‘The Pyramids of Giza’, we maybe have to change the question of ‘WHEN’ is it that we are creating this energy and ‘WHEN NOT?’ into ‘What in the … bleep … are we really recording?! Traveling through time and space with the speed of Lambda*nu. 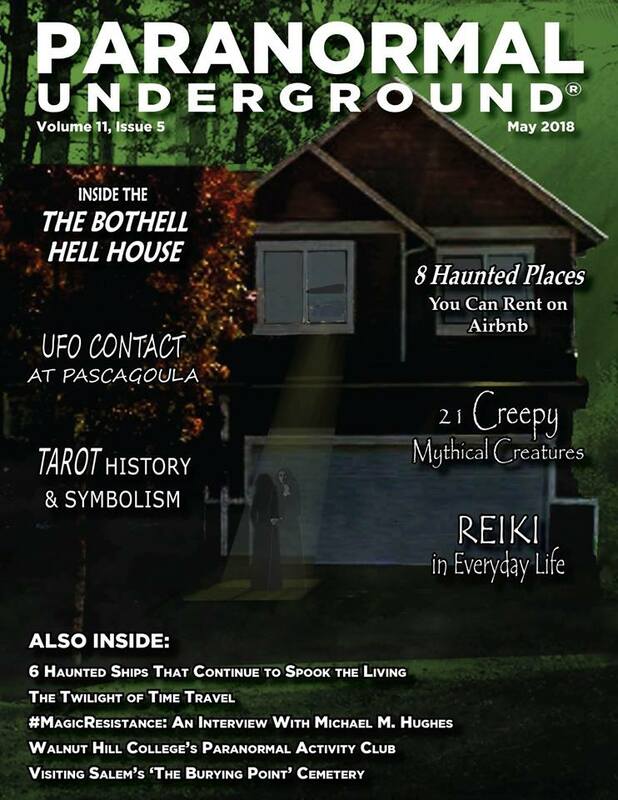 Paranormal Underground” magazine is traveling through time and space again by making the May issue available. Boundaries are being broken when a UFO contact at Pascagoula, 21 creepy mythical creatures from around the world, tarot history and symbolism, and six haunted ships are being spotlighted with the speed of Lambda*nu. As you all know I am a published investigative journalist, radio correspondent and columnist … besides writing articles in-which the (yet) unexplained is being supported with scientific facts, I also conduct interviews in-where scientists can explain the reality behind what is thought of by many being as science-fiction. 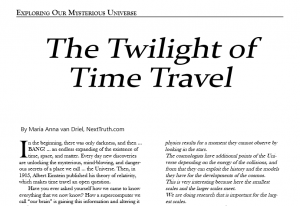 This year we will start with the publication of the magazine ‘The Next Truth’ that highlights mind dazzling paradoxes and gnawing questions concerning the well-kept secrets of the paranormal and the universe combined with scientific facts. 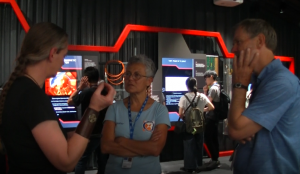 In this I thought it would be fantastic if some of you would lend us some of your time and provide the upcoming readers with 500-700 words concerning you as an open-minded scientist, thoughts about e.g. 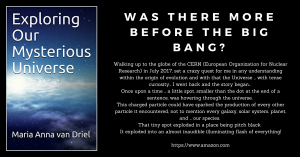 why science cannot explain the strange behaviors in the universe, advanced light-communication, remarkable plasma evolutions, laser developments, bio-electrics but also … your personal experiences in the paranormal, investigations, photo’s with the story (NOT copied from internet) and so on. Please, keep your writings respectful towards others. 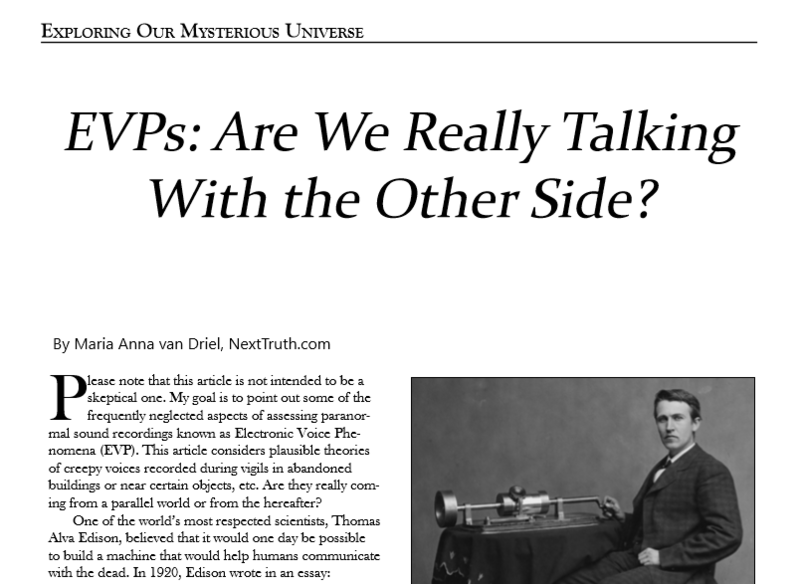 By combining scientific facts and / or Experiments with the different personal experiences of people … a strange but clear thread can emerge having the possibillity of providing a plausible answer (or answers) in and from both sides. This with a view to bringing back the two trees of life with which a new view of the world is possible. 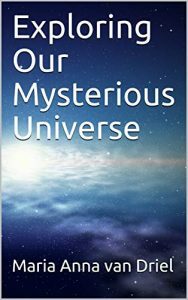 Becauce let’s be honest, we all want secretly to know what is hidden behind the unexplored scenes of the Universe….right? ‘I do not you know if my story fits the theme.’ … No problem! Simply email us some of your experiences / stories and we will see which fits most closely with the Theme of that month … the first edition has the Theme ‘Communication’ (through light, energy and particles). You can think of eg. methaphysics, telepathy, remote-viewing, dream-walking but also directed energy, tachyon energy, neutrino communication etc.